During the London Book Fair I walked around a lot and spoke to many publishers. Accent press was one of them. They were lovely and I received a Between the Raven and the Dove ARC. The cover drew me in, because it looked kind of witchy. I love witchy stuff, so I was really excited to read it. As far back as she can remember, thirteen-year-old Mag has lived with her father at a home for the mentally ill. The patients are all clearly mad, so when the usually silent Grace claims that she’s Mag’s real mother – and also a witch – Mag’s world is turned upside down. As things take a turn for the weird, and Mag sees things that others can’t, it may just be that she is a witch after all. I’ve been having trouble reading lately, I just can’t stay focused (unless it’s SJM). 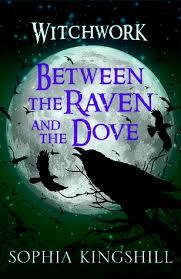 But not only did the cover of Between the Raven and the Dove draw me in, the story did as well. I immideatly felt for Mag. Growing up without your mother, in a mental hospital, with a father who hits you and all the while having a name like Maggot. This is a great formula for a bad school experience. I read that some people could not connect to her at all, I certainly had no problem with that. The story is told from Mags perspective and you feel with her as her whole world is turned upside down. I liked the whole island setting as well, but sometimes I got confused if everything was on the island or not. The island made it seem like a bit of Greek mythology coming into play. However, it actually has roots in non-fiction folklore. Sophia Kingshill took an interesting turn with witches. It’s not your standard witch, nor is it the Power of three kind of witches. No, these witches use magic through listening to other peoples and things’ song. She listens to a stone’s song and can make it throw himself. They also need to find their own song and more importantly their witch name. When a witch finds their name they gain their full power. It’s a very interesting take on things, and also makes for a very interesting story. I loved the creatures! Hobbs was adorable and Boggs as well. I just wish that I had seen more of them and gotten to know more about them. Though I liked the story, there were a couple of things that I wished she had done differently. I wish that Mags wasn’t your standard over powerful YA magical hero. Okay, it is explained why, but still. Also I really hated Grace from the beginning. To do that to your child, and the way she talks to Mags and does things throughout the book, it just annoyed me to no end when her name was mentioned. And the ending made me hate her even more. Like, Really?! Overall a great read for kids who go from Middle Grade to YA, as the main character is 13, but it still uses some big themes. I loved reading it and it helped me get over my reading slump! This entry was posted in Review and tagged Accent press, Between the Raven and the Dove, Fantasy, Middle Grade, Sophia Kingshill, YA.